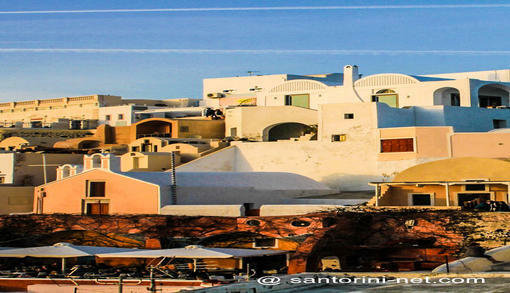 Oia (or Pano Meria, Apanomeria, pronounced E-ah) is a traditional, charming settlement located on the northwestern part of Santorini, at the top of steep cliffs and on the rim of the Caldera about 300 meters above the Aegean Sea. 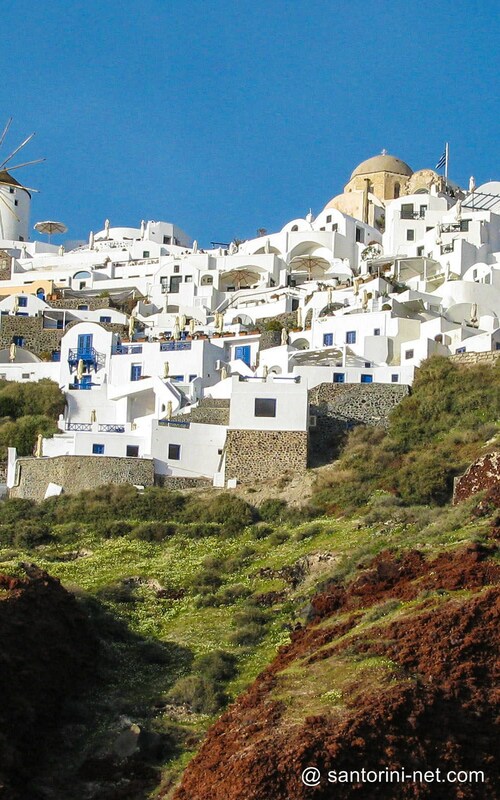 It is about eleven kilometers from Fira with fantastic views over the crater rim in one direction and the stunning coast of the island in the other. The village was devastated by the 1956 earthquake but quite a number of houses survived and many have been restored. 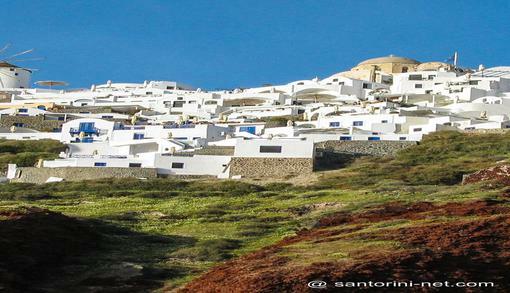 It can be reached by regular buses from Fira, taxis or rental cars. This traditional town is a maze of narrow lanes and steep stairways and a walk through the streets offers the opportunity to appreciate its unique architecture. Cave houses sunk deep into the volcanic soil, many tiny churches with shining blue domes, their whitewashed walls, sparkling in the sunlight. Just exquisite. 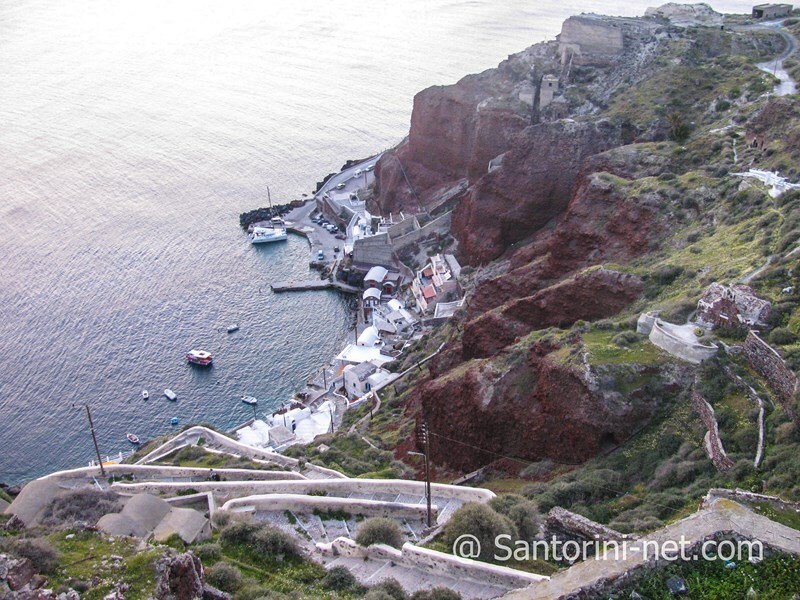 Many people gather on the cliffs of Oia, overlooking the sea and admiring the large bay created by volcanic caldera. 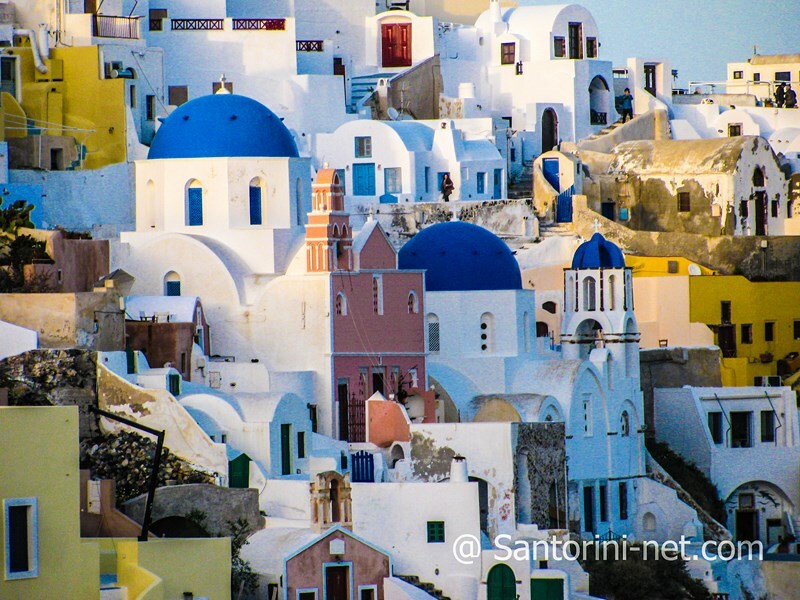 Here you can stay at the many hotels (with options for budget conscious travelers as well as some luxurious), traditional villas and rooms to let that overlook the volcano and the Aegean Sea. Oia, is the ideal place for those who seeking peace and quiet surrounded by unique natural beauty. 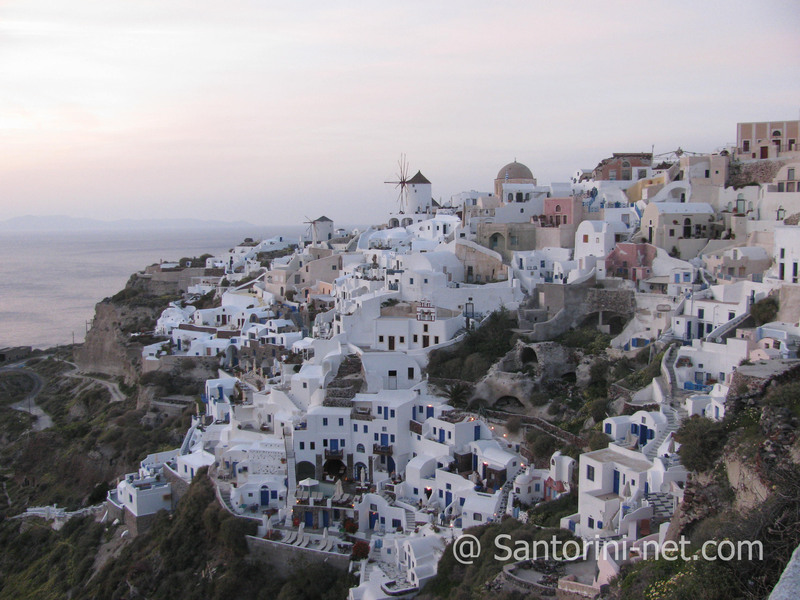 Oia is highly regarded as the location of one of the world’s great sunsets. Tourists gather to watch the golden sunset, the huge orange sun dipping into the sea, so it is recommendable to get to the Castle – the best place for the view. Once you arrived, be hurry to find a vantage point. And finally, as the sun slowly slinks down behind the horizon remarkable colors that range from blue and purple to red and yellow fill every nook and corner of the region. The scenery is incredible and the entire village breaks out in applause. And after that an amazing tranquility. This memory will definitely stay in to your minds forever. You can admire the sunset while having a meal or enjoying a refreshing drink at the many cliffside cafes, romantic restaurants and taverns. Dining can be anything from gourmet cuisine to home-cooked traditional Greek food. The village has a much quieter nightlife scene than Fira though there are a couple of places to dance. Oia hosts a cultural centre and many art galleries. It has several shops that sell jewels, handicrafts, mirrors, antiques, souvenir, gifts, hand-woven carpets from the Dominican cloister and other items to help you remember your visit. Worth a visit to the Naval Maritime Museum to get a sense of the area’s maritime history. The Museum houses old maritime equipment, some fascinating model ships and a collection of rare figureheads. Two volcanic black sandy beaches can both reached by stone staircases from the village: Ammoudi 214 steps and Armeni 286 steps! Here you will find a couple of taverns and boat trips to Thirasia. 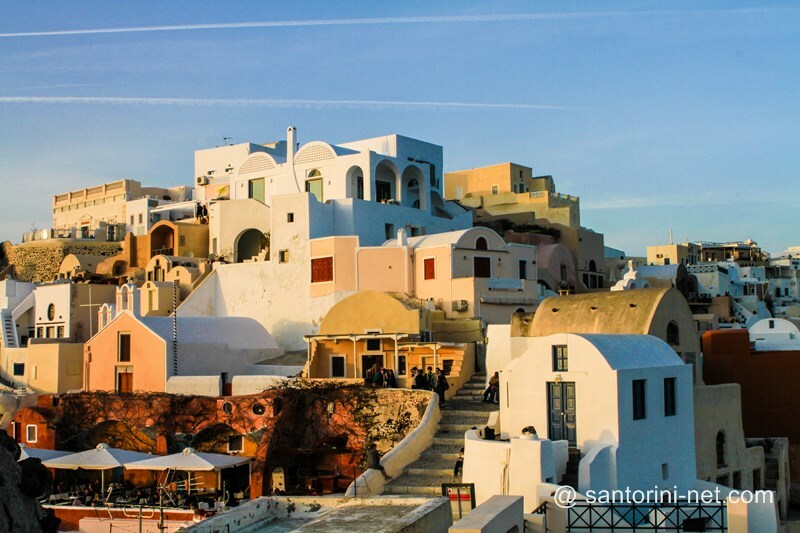 Oia is an absolute must-see for each visitor, even if one only passes a very short time on the island.